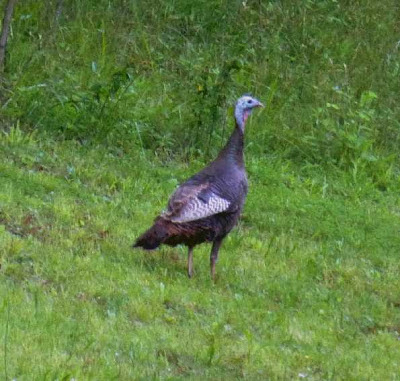 We’ve picked the Wild Turkey as the November bird for our 12 Months of Birding series. We see Wild Turkeys at the Inn on Mill Creek quite frequently…they seem to be big fans of our apple orchard. As year-round residents, Wild Turkeys enjoy scattered open spaces in Pisgah National Forest (like our orchard) and feast on acorns, fruit, insects and fern fronds, all of which are in good supply here. It is not uncommon for turkeys to hang out in groups, and we’ve seen 15 to 20 turkeys — mostly mama hens and their chicks — foraging around and wandering from one end of the property to the other, with the occasional male strutting his stuff with a puffed up chest, fanned out tail and “gobble gobble” call. The turkey is one of only two domesticated birds that originated in North America. Wild Turkeys were transported to Europe from Mexico in the 1500s and were domesticated there. English colonists then brought them back when they settled on the east coast. A domesticated turkey can be distinguished from a Wild Turkey by the color of the tip of its tail (white for domesticated turkeys, chestnut brown for Wild Turkeys). By the early 1900s, the Wild Turkey was eliminated from much of its range due to hunting and habitat loss, but reintroduction programs starting in the 1940s, in which Wild Turkeys were caught and transported to other areas, resulted in successful spreading of the population. Wild Turkeys can now be found in every state except Alaska.